We Vardhman overseas offers our client a wide range of Cotton Clothing to our client. we have designed and developed a wide assortment of cotton items in our fully equipped manufacturing unit. In our hi-tech production unit we skillfully meet the bulk demands of our clients. In addition, our professionals ensure that every aspect of the offered product is perfect with any defect. We have tagged our cotton items with industry leading price rates. 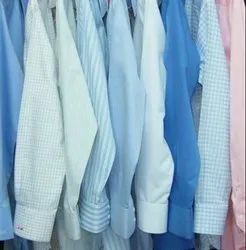 We offer a wide gamut of Mens Organic Cotton Clothes which are highly demanded by the clients for their unique and attractive designs. Our product range is available in various patterns like v-neck, round neck and many others that contain prints, embroidery and plain designs. Our product range can be worn occasionally. This lightweight hooded sweatshirt for women is perfect for any season! The plush pullover has a classic kangaroo front pocket and is pre-shrunk and laundered. The fabric is made from pure cotton and has a fabric weight of 260-270 grams. 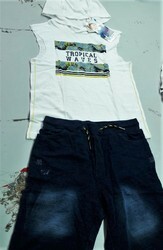 We design T-shirts, Bermudas, baba suits, caprices, three forth pants and trousers. This set is made of cotton rich fabric which ensures your baby's skin breath easy and keeps him comfortable. Makes your baby look all the more adorable. Made of 100% cotton for extra softness. Toddler suits with cute prints are essential to any baby's wardrobe. Machine washable. An exclusive range of Cotton Mini Dress ST No. AK 21 offered by us in a host of alluring designs and patterns. Available in various soothing and eye catching colors, the range is soft and smooth in touch and also shrinkage free and color fast. We are engaged in offering an alluring range of Ladies Cotton Dress that is made using a quality fabric and exhibit a blend of vibrant hues, attractive patterns and prints, designs and styles. Our entire collection is a part of designer frock, which is stitched to perfection by our team of craftsmen. Ideal to wear in social gatherings, these are in sync with the today's fashion market. We are one of the renowned names in the manufacturing, exporting and wholesaling of a striking assortment of Cotton Dresses. These soft cotton dresses come with spaghetti shoulder straps and double frill on the bottom hem. Perfectly and elegantly designed, our range is extremely comfortable and helps in free movement. Clients can avail these exclusive dresses at market leading prices. We are engaged in offering a comfortable range of cotton garments. Use of skin-friendly and soft fabrics made these products the top most choice of our customers. Our products are available in vivid colors, beautiful patterns and eye-catching designs. We are mostly looking foreign queries. Embroidered Cotton Tunics offered by us are designed by our creative designers and artisans. These tunics enhance the beauty of the wearer thus displaying our artistic excellence. Our array is known for color fastness, perfect stitch, washable and shrink proof features. We offer these embroidered kurtas in various patterns and sizes. Our expertise lies in our range of Cotton Garments. We manufacture these garments precisely with the purest form of cotton fabric that is blessed with high strength and longer life span. We offer very good quality hand made cotton clothes to our customer. Cotton is a very skin-friendly material and to make it more captivating we have embellished it with varied designs. Their designs and the comfort level they offer make the entire range more attractive. These embroidered tunic strikes the eye of the onlooker due to its simplicity yet stunning designs. These embroidered tunics are a perfect mix of contemporary and classic designs. We offer a wide range of sarees and salwar kameez in a wide spectrum of colours, elegant patterns and designs at competitive prices. These are manufactured from quality cloth material by our vendors. Ensuring that our range meets the stated industry standard, we conduct several tests and offer only best.